NOTE: Levels are two hours in length and players are starting with 30,000 in chips. On a board of 9 7 2 Evelyn Ng bet 1,400 and got one caller. The 2 fell on the turn, and Ng bet 2,400 and her opponent folded. She was at about 10,000 after the hand. Johnny Lodden bet 450 with the 3 2 and got two callers. A third player elected to make it 2,050 and Lodden called. The player next to act shoved for just 6,000 more and it was folded to Lodden. He made the call and was up against pocket kings. The board ran out good for Lodden as it came Q 6 2 6 A , giving him a flush. He took the pot and was at 45,000 after the hand. 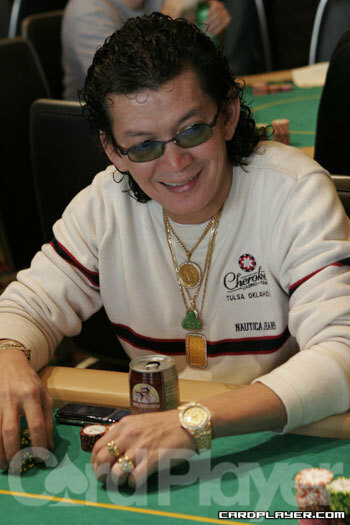 2007 champion Jerry Yang opened up the action to 1,000 and was three-bet to just over 2,000. Yang called and the flop fell A-J-5. Yang checked and faced a continuation bet of 2,500. Yang check raised to 6,000, and his opponent made it 12,000. Yang shoved for about 22,000 and was snapped called by a set of jacks. Yang tabled top two pair and failed to improve on the turn and river. He was gone early in yet another main event. On a board of Q 6 4 , Jani Sointula flopped top set of queens against the apparent over pair of his opponent. He got three streets of massive value and is now up to nearly three times the starting stack. Jani Sointula has busted out of the tournament. High Roller Report: Jose Barbero Wins! Team PokerStars pro Jose Barbero has added another tournament title to his collection along with Â£556,000 in prize money. Jani Sointula is the runner up with and he takes home Â£335,000. Sointula doubled up to 2.9 million and Barbero was left with a million. Neuville was eliminated in eighth place and he took home Â£45,900 in prize money. Greg Mueller moved all in with A Q and was called by Brian Powell who held A K . The board fell 9 6 5 8 6 and Mueller shook his opponents’ hands and made his exit. He leaves with Â£26,400 for 22nd place. Phil Ivey and Jani Sointula ran into each other for the second and final time today. Ivey made it 20,000 from the button and Sointula moved all in for 197,000. Ivey did not look happy as he contemplated the call. He decided to go with it, moved his chips over the line and flipped over pocket fours. Sointula showed Q J and waited for his fate to be determined. The flop came down J 9 2 and Sointula moved ahead. The turn was the K keeping Sointula safe. Ivey would need one of the two remaining fours to win the pot, and that’s exactly what came down. Ivey now closes in on the 800,000 in chips mark. Thomas Bichon made his last stand in the main event against Viktor Blom, but it was not meant to be for the French pro when his A-Q could not beat Blom’s K-Q. Blom found a king on the flop and waved goodbye to another opponent. He’s currently nearing the million in chips mark. After moving all in and chopping a pot with Bojan Gledovic, Roland de Wolfe survived once more, this time doubling through Marc Inizan. With just under 80,000 in chips, de Wolfe shoved with A 8 and Inizan called with 10-10. De Wolfe binked an ace on the turn and doubled his stack. Andrew Pantling bet 18,000 from under the gun and Dan Fleyshman moved all in from the cut-off for the best part of 300,000. Pantling went into the tank and when he came out the other side, he opted to call. He flipped over 10 10 and saw he was up against A Q . The board came down J 6 4 A 5 and Fleyshman doubled up to over 600,000. Arnaud Mattern’s pocket queens ran head-first into James Bord’s pocket aces. 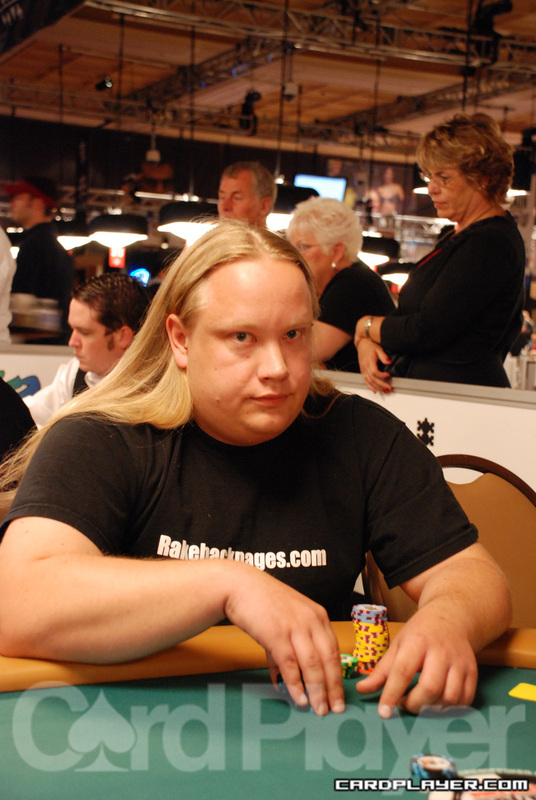 Viktor Blom triggered a raising war and then stepped out when Arnaud Mattern four-bet. Bord then shoved and Mattern made the call. The hands stood as they were after all was said and done, and pocket rockets were enough to send Bord sky-high into the chip lead, crippling Mattern down to just 12,000. Before the first break of the day however, Mattern managed to double up three times. First with pocket sixes versus Brian Powel’s K-Q, then with A-3 versus Anthony Newman’s A-Q by hitting a 3 on the turn, and finally with pocket eights versus Viktor Blom’s K-9. Mattern made a set on the flop and is now on a little more than 180,000. On a board reading 7 6 4 9 , Jani Sointula checked, and Joe Cada bet 2,150. The river was the 10 and Sointula bet 3,800. Cada called and Sointula showed 10 10 for a rivered set. Cada showed pocket eights and took the pot with his straight. He is now sitting on 110,000 in chips. It seems like Jani Sointula is doubling up all of the World Champions in today’s field. Sointula just doubled up Carlos Mortensen holding K Q on a board reaing Q 10 2 10 5 . 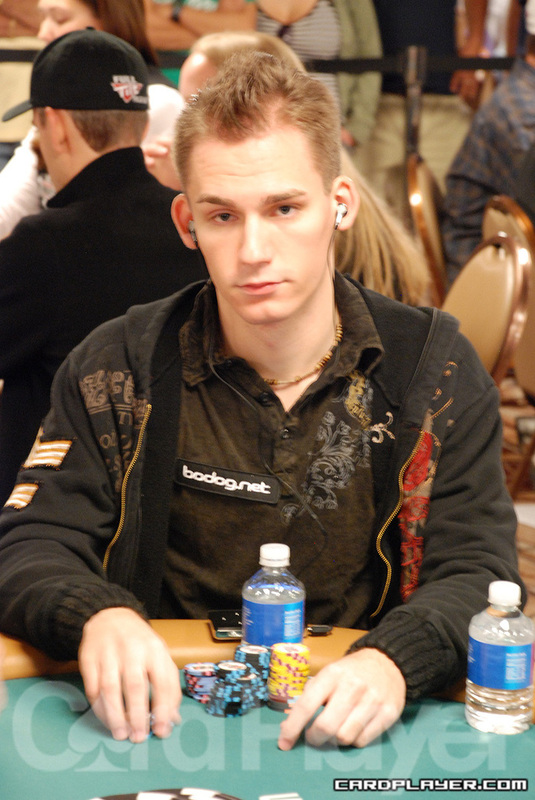 Mortensen showed down A 10 for trips to double to 35,000 in chips. Shak won the hand and Sointula was eliminated. Shak’s stack is now in the land of 100,000. Bill Chen and his opponent got in four bets preflop and took a flop heads-up. The flop was A 9 2 and Chen bet 1000 after his opponent checked. The bet was called and the turn was the Q . Now Chen’s opponent bets 2,000 and Chen called. The river was the 4 and both players check. Chen shows the K K , while his opponent shows the K K and they chop the pot. Jani Sointula and David Chiu crossed paths in a pot. The flop came down Q Q J and Sointula bet 1,000. Chiu made the call and the turn was the 2 . Sointula quickly threw in 2,000 and Chiu called just as quickly. The river was the 7 and another 2,000 went into the middle courtesy of Sointula. Chiu made the call and Sointula tabled A Q for a set and Chiu mucked his hand. After dropping that hand, Chiu was down to 130,000. David Benyamine and Mikhail Tulchinskiy were involved in a hand that saw more than 14,000 in chips enter the middle by the turn. The board showed A 5 9 5 and Tulchinskiy fired 2,000. Benyamine raised to 4,000 and was called. The river was the A and Benyamine checked again to Tulchinskiy. He fired another 2,000 and Benyamine looked disgusted. His head turned away from the felt, he threw in the call and Tulchinskiy showed 8 3 4 2 for a bunch of busted draws. Benyamine showed K 6 5 4 for a pair and an 8-low and scooped the pot. Benyamine was around 180,000 after winning the hand. There was a bet and a raise on a flop of K J Q between Scotty Nguyen, Daniel Alaei, and Fabrice Soulier. All three of them saw the turn which was the J .
Nguyen leads out for 2,000 and gets two pretty quick folds. Disgusted with himself he shows the J J . “I only bet because I thought there were kings and queens full out there,” said Nguyen. After the hand, the defending H.O.R.S.E champion’s stack improved to around 163,000 in chips. Four players called Annie Duke’s big blind of 1,000 and she checked her option. The flop came down J 9 6 and Eli Elezra led out with 1,000. Duke mucked and David Chiu made the call. Alexander Kostritsyn also called and the action was lastly on Justin Smith. He raised to 2,000 and everyone called. The turn brought the 10 and the action was checked around to Smith. He bet 2,000 and Elezra called. Chiu got out of the way and Kostritsyn made the call. The river was the J and the action was checked to Smith again. He bet another 2,000 and his opponents mucked, sending the pot his way. Smith was around 180,000 after the hand. Justin Smith and Huck Seed are heads up in a pot with on fourth street with their boards looking like this. Smith checked called a 1,000 bet from Seed. Even though Smith hit the worst card in the deck for his hand, he still called 2,000 from Seed. Out of turn, Smith led out for 2,000. “You are betting now, you want to check?” said Seed. Since Smith’s action was out of turn, they both check and they go to the river. Seed bet 2,000 on the river and was called by Smith. Seed announced “King-nine” as he showed the K-9-4 as he three down cards. Smith mucked and Seed took the pot. John Hanson completed the bet on third street showing the 3 and was immediately raised by Ali Eslami, who was showing the 4 . Joe Cassidy called two bets cold showing the 7 and John Hanson called the extra 1000. On fourth street, Hanson bet 1000 and was called in both spots. Eslami checked fifth street, Hanson bet and got a fold from Cassidy, but Eslami stuck around for another card. Eslami now bets and gets raised by Hanson. Eslami instantly calls and on the river Eslami checks and calls a bet from Hanson who shows the (A -4 -8 ) as his down cards, good for an 8-6-4-3-A and the pot. Picking up the action on fourth street, Steve Billirakis and Justin Bonomo were tangled up in a hand. Billirakis bets 1,000 and Bonomo makes the call. Bonomo paired up and led out with 2,000. Billirakis made the call. Both players received a queen and both players checked. The river was dealt and both players checked again. Bonomo then showed down (J J K ) and Billirakis mucked. 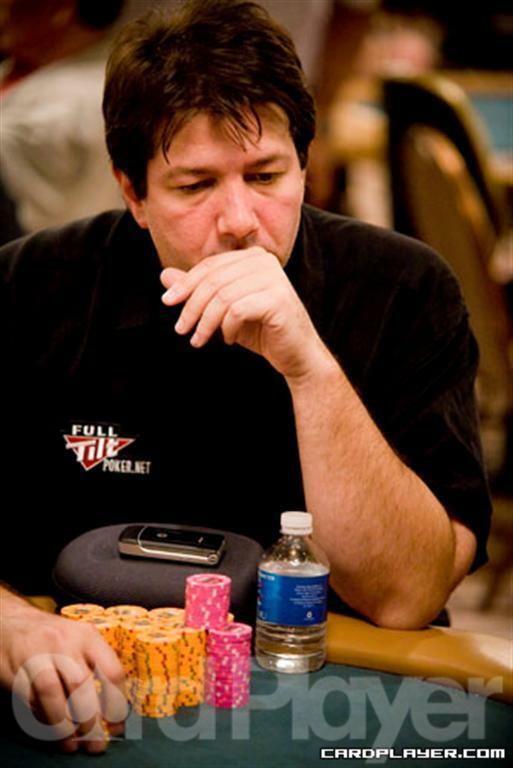 Bonomo raked in the pot and was around 145,000 while Billiarakis was around 190,000. Freddy Deeb bet fourth street and got three callers. He bet fifth street and was only called by Steve Sung. They went to sixth street heads up. Sung checked and called 2000 from Deeb on sixth street and the river was dealt face down. Sung checked the river and Deeb bet again. After a few moments, Sung turned his up-cards face down and mucked his hand, giving Deeb the pot. Picking up the action on sixth street, Phil Ivey and Erick Lindgren were involved in a hand. 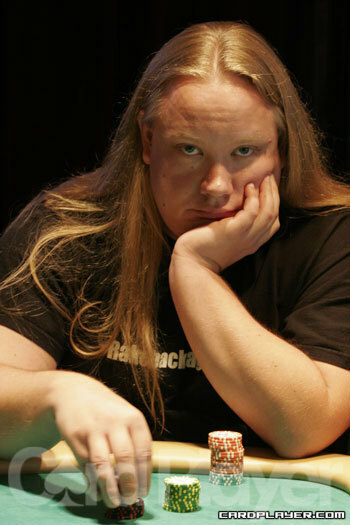 Erick Lindgren fired out 2,000 and Phil Ivey raised it to 4,000. Lindgren made the call and the river was dealt. Ivey bet another 2,000 on the river and Lindgren called after some thought. “No pair,” Ivey said as he showed (7 5 -X) for 7-low. Lindgren tabled (A Q -X) and the players chopped the pot. 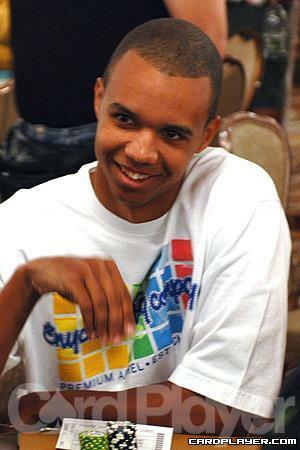 “I hate playing with these people that only play no-limit,” Ivey joked after the hand. Lindgren gave a grin and Ivey followed suit. Jani Sointula pushes all-in for 12,900 and the player in seat 1 calls. Sointula shows pocket aces, and his opponent reluctantly flips over pocket queens. The first four cards to hit the felt are K J 2 10 which means a queen would give Sointula a straight, and his opponent has an up and down straight draw. The river is the J , and Sointula takes it down. The two players shake hands and the loser goes to leave when another player on the table shouts, "Wait! You're still in!" He comes back to find he is facing 1,125 chips with only minutes left to end of play. Italian Gino Alacqua has hit the rail holding Q Q and all in preflop when the board ran out K 5 2 4 A . His opponent, Jani Sointula, bet the river forcing a third player who had limped and checked the flop and turn to fold before turning over 5 3 for a rivered straight. Jani Sointula has busted out of the tournament on day 1A. Irish Open champion Neil Channing flopped a set of fives againt an up and down straght draw and and the turn gave his opponent a flush draw also but Channing's hand was good and he scooped 15,000 chips and is now sitting on around 15,000. "I think it was some young American guy who's like, too young to play in American but has done something on the internet," said Channing with a characteristic sardonic tone.